Please join us Thursday July 25th at 5pm for a Precious Gem Safari at the Eve J. Alfille Gallery & Studio where you can take a hands-on look at Eve’s array of precious gemstones in both their mineral and set/unset faceted form. Enjoy wine and munchies as you discover Eve’s treasure trove of designer jewelry and unique wearable art. 10% of all event sales will benefit the Karen Dove Cabral Foundation which offers financial assistance to young women with breast cancer who are challenged to meet the needs of their household while undergoing treatment for their condition. Please RSVP by July 18 by contacting the gallery at (847) 869-7920 or by completing the RSVP form below. While the Antarctic has become a sought- after destination for visitors in quest of a new and uncommon experience, the travelers on cruises only get to visit the most accessible edge of the continent, at the tip of the Antarctic peninsula, and that for a relatively short time. 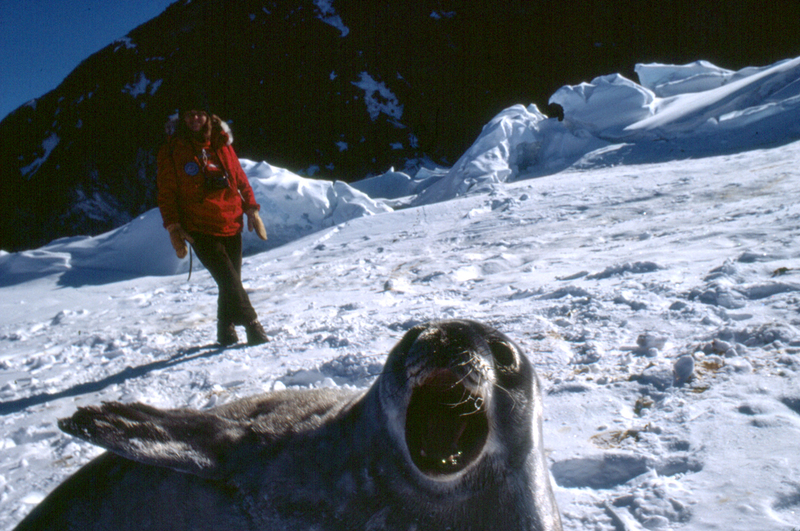 Working at one of the Antarctic research bases, however, is a much different experience. Paul Alfille, now Division Chief of Thoracic, Vascular and Neuro Anesthesia at Massachusetts General Hospital in Boston and an assistant professor at Harvard Medical School , was a medical student when he was tapped to be part of a medical research expedition at McMurdo Bay, the U.S. Antarctic base, situated relatively close to the South Pole. His stunning photographs, which he will present along with stories of day-to-day life on the base, depict his experiences and that of the team headed by Prof. W. Zapol, a former speaker to The Pearl Society. 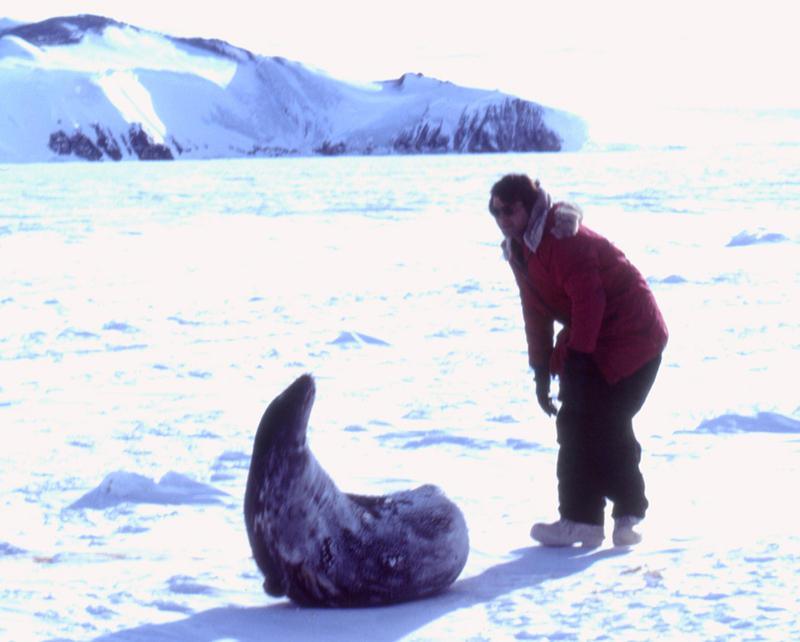 The assignment was to research Weddell seals, huge mammals who can dive and stay underwater for more than an hour. Because of this research, newborn “blue” babies in hospitals everywhere can now be helped. “But first, you have to catch the seal. . . ” The photos tell the tale, and many others. After Paul Alfille, my son, spent that austral summer in Antarctica, his pictures revealed to me a universe of beauty and tragedy. The thought has been with me since, and has inspired the special jewelry series: Voyage to Antarctica. Come meet Paul (who, incidentally, is also the developer of the first version of Freecell, the well- known online time stealer), but don’t ask him to show you his scar from the seal bite! While you were sleeping . . . .Eve was designing. Did you know that artist Eve Alfillé designs every single one of the beautiful & varied gemstone bead necklaces in her Evanston Gallery? In addition to designing all the jewelry in her display cases, Eve designs every one of the many necklaces hanging on the wrought iron tree displays in the front of her artistic gallery space. Its true, each necklace is from Eve’s fertile imagination using a wide array of gemstones and pearls held in her studio and gem room. A consummate night owl, Alfillé also designs her jewelry treasures into the wee hours of the morning. “At a certain point, somewhere around 1 or 2am, I reach a sort of “creative high” which results in very interesting blends of color and form. 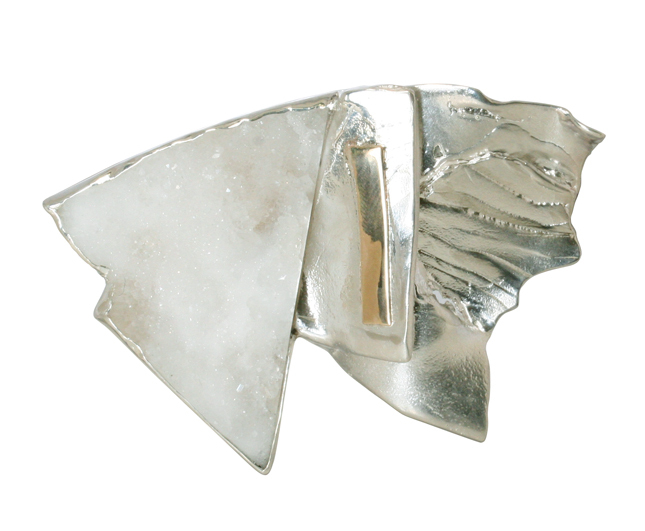 These are especially intricate combinations, with exciting sterling silver accents and different pretty clasps. While all together the quantity of necklaces she has could appear overwhelming, if you take a moment to look closely at just a few of the many unique necklaces she has created you will find many wonderful combinations of materials and visual surprises that you will enjoy for years to come. The next time you need a jewelry pick me up, or a wonderful, one of a kind gift, spend some time exploring Eve’s ever-changing collection of interesting and beautiful necklaces. “I especially enjoy designing these necklaces and bracelets for women who appreciate ‘unusual,’ and are not afraid of their feminine power,” Eve explains. 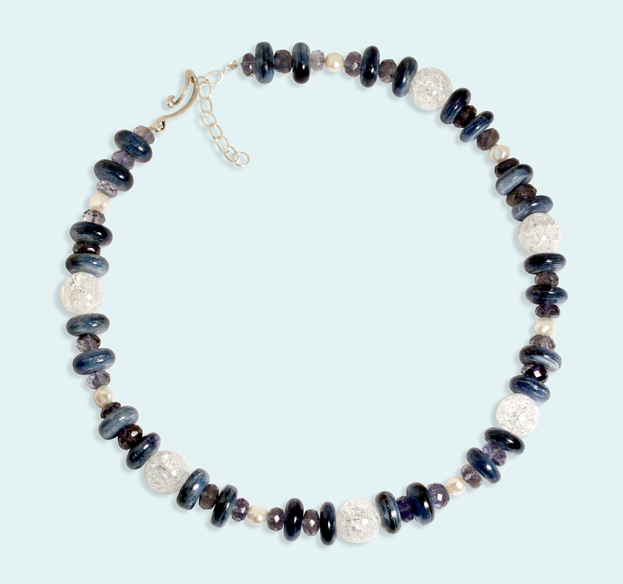 Here is a close up look at one of Eve’s many gemstone bead necklaces. Citrine, Flourite, Rose Quartz, Iolite and others with a 14k gold clasp. “Running Rapids II” necklace (left) from Eve’s “Les Petits Fruits” series features a pastel rainbow of different types of gems, including fluorite, citrine, rose quartz and iolite and others, with a 14 karat gold clasp. Each necklace is unique – however, the mood and look of each necklace Eve creates will be harmonious and use a beautiful combination of faceted, smooth and carved gemstones. In anticipation of the gallery’s upcoming exhibit opening party, artist and custom jewelry designer Eve J. Alfillé speaks about her choice of materials in the process of completing pieces for her new design series “Voyage to Antarctica.” RSVP Online for this special gallery event on May 4, 2013. 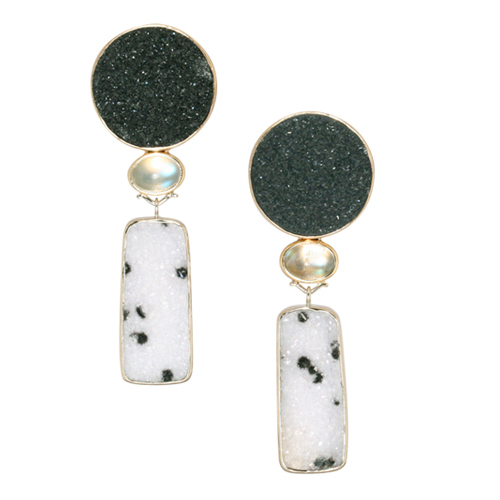 Free-form Schlangenhaute (snakeskin) agate with petal pearls, diamonds and moonstones and treated drusy removable drops. Q. Were there any materials that your guests would find unusual in the Series? Eve: The material selection process continues through the life of the series…and for years to come. When I saw this opaque, intense green gem, called Maw Sit Sit, I knew that was the contrasting experience. 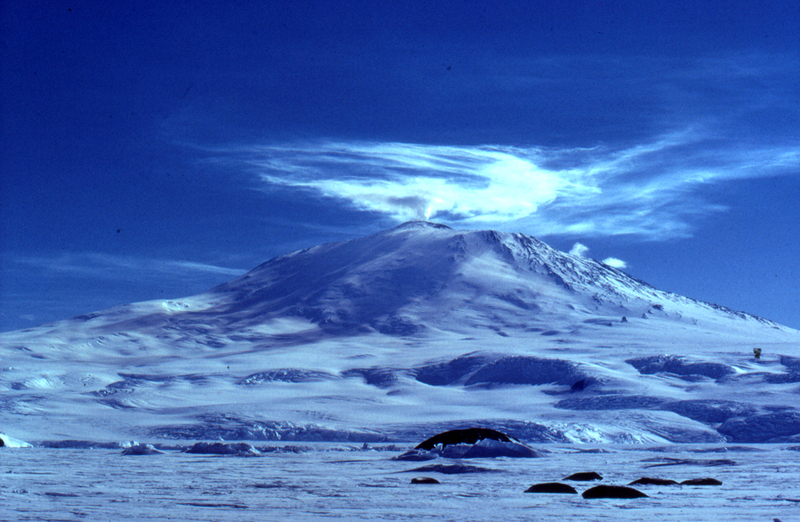 When Paul traveled to Antarctica, he first stopped in New Zealand. The lush greens are the last visuals before you enter the world of ice. Eve: Quartz. It is so beautiful, not only capturing the ‘look’ of ice, but the shine as the sun reflects off the ice. I was also attracted to aquamarines as I can see the water and ice together forming this beautiful texture and color. We need to remember the extreme cold in Antarctica. I use the cold as a way to understand the feeling of retreat that you experience in your mind. You become more introspective. It’s very different than a nice warm day at home. I then thought about images. For some series I can have a form that symbolizes it, such as an Acanthus leaf. For this series, I don’t have one, instead I have textures. If I go too literal, then the Series is about penguins! Q. Once you pick out some materials, what is next in the process? Eve: I assemble them, and I let the materials speak to me. Do you ever find that you start out making a necklace, or a brooch? Eve: No, it depends on what materials I have in front of me, and which ones speak to me. The first material was the opal and I added some diamonds to represent flecks of light. Some of the smaller pieces, I have an idea of what I want to do, but many form throughout the creation process up the day we are to exhibit! Q. I notice in this series, the little diamonds are often set in rows, but each is set separately from each other. Is there a reason for this? 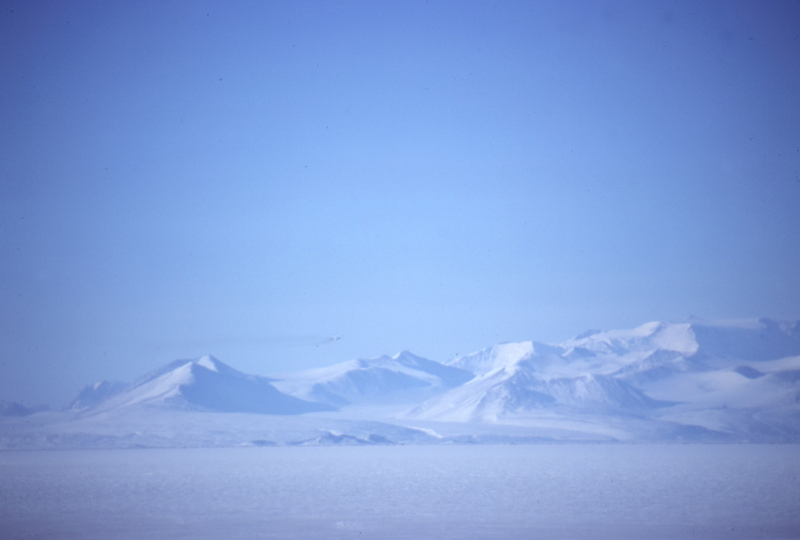 Eve: You know how I mentioned that when you are so far from your normal life, alone in the Antarctic, you can see things more clearly, with better perspective. So I imagined that just as you would notice each of the individual lights of the camp as your helicopter approached for a landing, you would also begin to see each of the elements of your regular life, back home, with more clarity because you are now away from it. So I turned to this method of setting diamonds as separate little ‘lights’ in this series. And these lights might seem a little lonely amid the pristine whiteness, but they illuminate a continent of vast beauty. Q. You mention the word ‘Organic’. What does that mean to you in the creation of a new series? Eve: Organic to me means that there might be some indeterminate curves, that there is some asymmetry. The more geometric pieces tend to have more symmetry. When I thought about the “Voyage to Antarctica”, I thought at first, it was a place of disorder. Then I realized and saw the repeating forms; there was order. I needed to reflect both the geometric and the organic forms. In anticipation of the gallery’s upcoming exhibit opening party, artist and custom jewelry designer Eve J. Alfillé speaks about the gems, the colors, the creative process and the emotions surrounding her new design series “Voyage to Antarctica.” RSVP Online for this special gallery event on May 4, 2013. The purest white, and the bluest of sky. Q. Does the sun have an influence in the creation of the jewelry? Eve: The sun is a condition of working in Antarctica. There are only a few who have stayed there during the dark days and nights. There is no contrast without the sun. Q. What emotions do you want collectors, visitors and guests to have when the view the new series ? Eve: I believe they will feel ‘awe ‘: awe evoked by the beauty, the majesty and power of the experience. It is where humility balances the inspiration and the feeling of omnipotence. Being in ‘awe’ is a pause for reflection. Q. Were you inspired by any individual gem? 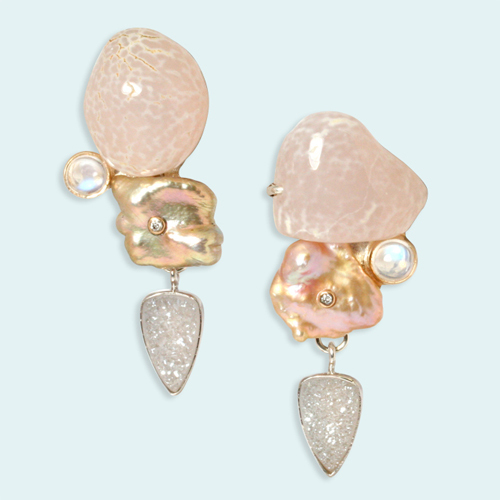 Eve: I’ve always been fascinated by opals and moonstones. An opal is one of the most versatile gems. It could be used as part of a landscape, or like here, an icescape. It’s a place where the imagination can find scenes in Antarctica…reflected. And moonstones capture light in a filtered way, very much the same way ice does. Q. Let’s talk about the creation process. Once you have the idea, what is the process you go through to make it come alive? Eve: The process is more about isolating the emotion(s). I wait for years sometimes until I have a specific vision of the colors and shapes I want associated with a particular series, and I won’t release a piece for production until I am completely sure it ‘sings’! Q. What is the emotion for the new Series? Eve: Immensity. Solitude (which is different from loneliness). Being able to contemplate life from a very distant perspective. When I identified where these emotions originated, I realized it was from the pictures I had seen from my son, Paul. Once the emotions and their origin are identified, then I start to see colors, textures and light as if I was standing in Antarctica seeing all the experiences for myself. Q. What were some of the colors you started to see? Eve: Pictures don’t really show all of the ‘sun’ colors, so I visualize myself in Antarctica. I begin to feel the experiences of seeing the sun rising and setting and the colors as they appear on the ice, the water and even the few animals that live in the immense space. Now I can begin to identify the materials that capture the experience.